Ha Long Bay (Vietnam) – November 14, 2018 (travelindex) – Best Western Hotels and Resorts will introduce a new Best Western Plus overlooking Ha Long Bay in northern Vietnam following the signing of a spectacular new waterfront hotel that will boast a breathtaking view of the UNESCO World Heritage site. Best Western Plus Ha Long Bay Hotel is an impressive new waterfront project that will elevate the standard of upper-midscale accommodation in this iconic destination. 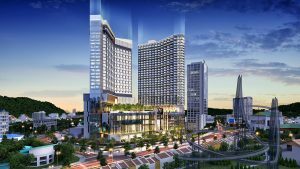 Developed by Tri Duc Hotel Joint Stock Company, this brand new hotel is currently under construction and scheduled to welcome its first guests in the third quarter of 2020. “Vietnam is one of the world’s most dynamic tourism markets, with a series of enchanting destinations attracting record numbers of inbound travelers. The volume of international visitors to the country has more than doubled in the last decade, and Vietnam is on course to set new tourism records again in 2018. This growth, combined with a buoyant domestic economy and forward-thinking government policies, makes it a very exciting time to be expanding in Vietnam,” said Olivier Berrivin, Best Western Hotels & Resorts’ Managing Director of International Operations – Asia. “We are very excited to be working with Tri Duc on this exceptional new project. At Best Western, we are always seeking strong, highly-respected and professional partners. Tri Duc has shown its skill and vision by creating Best Western Plus Ha Long Bay Hotel, an exceptional project that will further enhance this attractive destination. We look forward to working together to bring their vision to life,” Olivier added. Perfectly located on the idyllic Ha Long City waterfront, just a short distance from Ha Long Bay’s cruise port, the hotel will feature 327 rooms and suites, many of which will showcase Ha Long Bay’s spectacular seascape with panoramic windows and balconies. Guests will enjoy rooms equipped with comfortable beds, spacious bathrooms, contemporary amenities and complimentary Wi-Fi. An impressive collection of facilities will allow guests to indulge in the use of a spacious fitness center, infinity-edge outdoor pool, a large kids’ club and several retail outlets. Guests will have a choice of dining options with a lively all-day restaurant serving exquisite Vietnamese and international cuisine, a café and ice cream shop offering daytime refreshments and a rooftop bar with picturesque views for evening drinks. According to the latest data from the Vietnam National Administration of Tourism (VNAT), Vietnam welcomed a total of 12.8 million international visitors in the first ten months of 2018, which represents a sharp 22.4 percent increase compared to the same period last year. As one of Vietnam’s most iconic attractions, Ha Long Bay receives millions of domestic and international visitors every year. The recent opening of a new highway between Hanoi and Ha Long City, along with the development of a new international airport just 50km from the bay, will further enhance tourism in this desirable destination. Best Western Hotels & Resorts has identified Vietnam as a booming market, and the signing of Best Western Plus Ha Long Bay Hotel marks the latest phase of the brand’s expansion in Vietnam. This newest hotel joins the company’s growing list of high-end hotels and resorts including recent additions in Cam Ranh, Ha Long, Phu Quoc and Quang Binh. This nationwide portfolio is expected to grow as Best Western seeks to bring its timeless values of world-class hospitality and unsurpassed service to even more parts of Vietnam, further enhancing the country’s booming tourism industry.